Waad Mohammed wears black high top Converse “Chuck Taylor” All Stars in the film. Wadjda poster paired with the shoe lacing scene from the film. Wadjda is the story of a ten-year-old girl (Waad Mohammed) living in a suburb of Riyadh, Saudi Arabia and how she tries to deal with the restrictions placed upon her and other girls growing up the the repressive culture she faces at school and in her general daily life. It’s a world of mostly “nos”: no playing with boys in the neighborhood, no expression of independent thought, or no riding bicycles like the boys and other girls throughout the world because it is considered a threat to her virtue. At the time this film was made, women weren’t allowed to drive vehicles of any sort, and so we see Wadjda’s mother (Reem Abdullah) dependent on a hired male driver to take her back and forth from work every day. (That right was finally granted to women in 2018.) But Wadjda is not discouraged by her situation; rather she wants to have fun and continually pushes at any boundaries set for her by society, her family, and the headmistress at the all-girls school that she attends. Whenever people live in a repressive culture, they can always find ways around the system, and we soon discover that Wadjda is very good at doing that. Wadjda with her friend Abdullah. The main thrust of the simple story being told here has to do with Wadjda and her friend Abdullah. Wadjda sees that Abdullah has a bicycle like many of the other boys in the neighborhood. It becomes a fixation for Wadjda to get a bicycle of her own and learn how to ride it well enough that she can beat Abdullah in a one-on-one race. When her mother refuses to buy her a bicycle because it is frowned upon by society in general, Wadjda doesn’t give up. She makes a deal with Abdullah to teach her how to ride a bicycle in exchange for letting him put up lighting at their house for his uncle’s political rally. When Wadjda sees a green bicycle in a local store that she really wants to have, she finds ways to earn the money herself by selling things — mix tapes of popular music and handmade braided bracelets — or delivering messages from an older student at her school to her boyfriend. They can’t communicate directly with each other, again due to cultural restrictions and strict chaperone laws. But even these simple things are noticed by the authorities. When she becomes suspicious of what Wadjda is doing, the headmistress at her school, Ms. Hussa (Ahd) tells Wadjda to improve her behavior and warns her to stop acting and looking different from the other more conforming students. Ms. Hussa even criticizes Wadjda’s shoes, which compels her to take a marking pen and darken the white foxing and toe caps of her beloved chucks. But Wadjda refuses to stop wearing them, and luckily, her chucks still look good even when marked up (a tradition that many young chucks-wearing kids have carried on throughout the years). With her ability to make some money on the side now restricted, Wadjda decides the only way she can make money is to join the religion club and compete in the Quran recital competition, which has a cash prize of 1000 riyals, more than enough to purchase the green bicycle. This change very much surprises Ms. Hussa, but Wadjda is allowed to join. At school the headmistress is passing out warning posters. At Wadjda’s home there are problems in the marriage between her mother and father. Her mother cannot bear anymore children and Wadjda’s grandmother is actively searching for a second wife for her son. Wadjda’s mother tries to prevent this from happening. She buys a beautiful red dress to wear at a family wedding in the hopes that she will scare away any other women who would want to marry her husband. The resolution to this and the Quran contest at school all play an important part in the resolution of this film. Wadjda drawing black ink on her chucks so they won’t stand out as much. Wadjda was the first full length feature film ever made completely in Saudi Arabia, so in that sense alone it has significance. The film is also a tribute to the human spirit and the fight for women’s rights. Writer/director Haifaa Al-Mansour has put together an uplifting film that makes a statement in a gentle way. Outstanding in the cast are Waad Mohammed in the title role, and Abdullrahman Al Gohani as her spirited friend and enabler Abdullah. One of the sweet moments in the film is when he tells Wadjda that he would like to marry her when they get older. This film gives westerners especially a glimpse into life in another part of the world, and it is family-appropriate entertainment as well. Although we see there are many things in Wadjda’s world that set us apart from her life, there are also many things that are very much the same in our culture. Wadjda relaxing on her bed. Wadjda loves wearing her black high tops with purple laces. Black high top chucks are an important symbol in this film; they represent Wadjda’s independence and desire to have the same rights as boys do in the repressive Saudi culture. When she is out in public or at school, almost all facets of her dress are controlled: her all grey school uniform, her black outerwear covering her head and most of her body. The only place where she can show freedom of expression is with her footwear. When she is lacing up her chucks, she is expressing her freedom of choice. 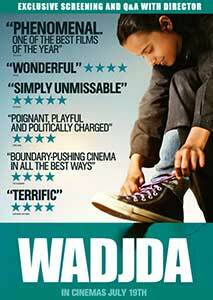 That’s why the posters and DVD cover for this film show Wadjda doing just that, lacing up her favorite shoes. Throughout the film there are many brief shots of her chucks as she goes about her daily routine at school and elsewhere. When she is at home and not under the strict dress code restrictions for women and girls, Wadjda is just like any other kid in the rest of the world, dressed in tee shirts, jeans, and sneakers — in her case a very distinctive pair of black high top chucks. 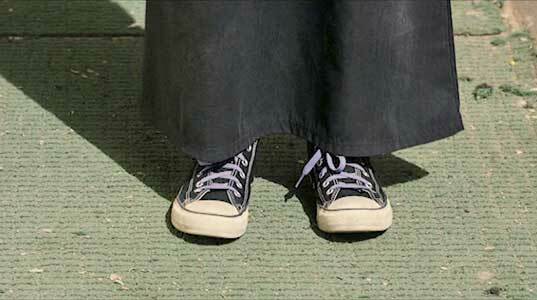 Close up of Wadjda lacing up her chucks. Wadjda. (2012) Waad Mohammed, Reem Abdullah, Abdullrahman Al Gohani, Ahd, Sultan Al Assaf, Alanoud Sajini. Written and directed by Haifaa Al-Mansour.